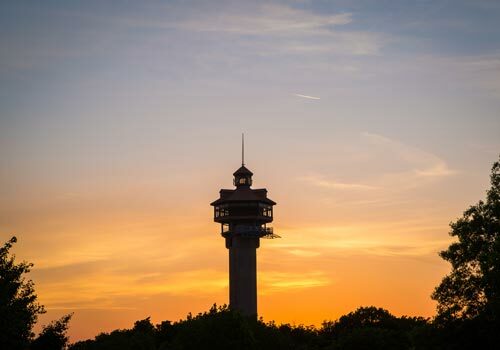 A colossal 230-foot structure situated in The Shepherd of the Hills Homestead, the Inspiration Tower is a must-see attraction for visitors to Branson, open year-round from 9 a.m. to 5 p.m. 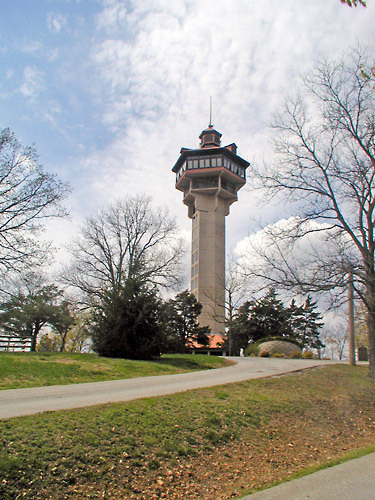 The tower contains two glass elevators, an enclosed observation deck, a gift shop, and a snack bar. Guests can also enjoy panoramic views of the area as far as 90 miles away on clear days. 230' High with 360 degree views. On a clear day, you can see over 90 miles. Vigilante ZipRider departs from top of Inspiration Tower. Located at Shepherd of the Hills Historic Homestead. Built in 1989 to commemorate 100th anniversary of Harold Bell Wright's Shepherd of the Hills novel. 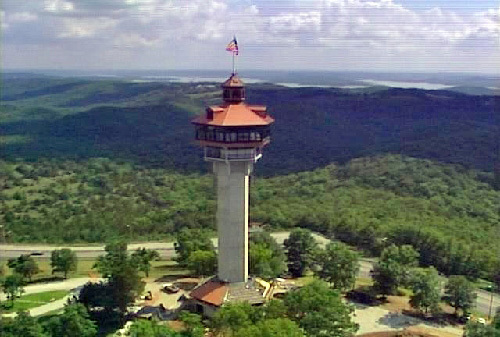 Inspiration Tower sits atop one of the highest points in Southwest Missouri. Visitors travel 230' up in a glass elevator to step out into a commanding 360-degree view ranging from the splendor of the Ozark Hills, all of Branson and even as far as the Arkansas ridge of hills. During the holidays the Tower is transformed into the area's largest Christmas tree, which acts as the stunning finale to the Shepherd of the Hills Trail of Lights. Don't miss this historic landmark! 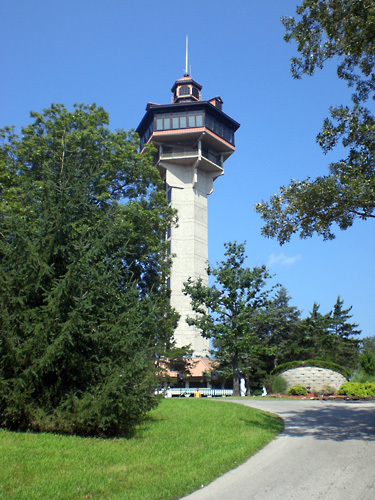 Tower hours of operations are 10:00 am - 4:00 pm throughout the year and is open every day weather permitting. Yes, they offer two glass elevators that will take you to the enclosed part of the tower. Is there a restroom at the tower? Yes, on the ground floor.